Via HockomockSports we share the results of the FHS spring sports action on Wednesday, April 11, 2018. – Franklin scored five runs in the first inning and never looked back to secure its first win of the season. The Panthers tacked on four more in the second, five more in the fourth and a single run in the sixth inning. Kylie Bouzan and Meg Caron finished with two RBI apiece while Emily Valentino earned the win, striking out four while scattering six hits. For Oliver Ames, Marissa Guarino was 1-for-2 with a double and a run scored, Kayla Georgeu added a double, and Katie Abreu scored a run. – Halle Atkinson and Shannon D’Arcangelo each recorded three goals to pace the Panthers to a win at home. Alex Field scored her goal of the season while Victoria Quinn had a strong game in midfield with four draw controls. Grace MacCallum anchored the defense with three ground balls. – Franklin earned a clean sweep, dropping just one game in the five matches. Rohan Herur and Saketh Saripalli each won 6-0, 6-0 at first and third singles, respectively. Liam Marr recorded a 6-0, 6-1 win at second singles for the Panthers. The team of Tyler DiPalma and Derek Wu (first doubles) and the pairing of Tony Calderone and Dan Angermeier (second doubles) each won 6-0, 6-0. – Oliver Ames defended its home court with a sweep of visiting Franklin. Sarah Leger won 6-1, 6-0 at first singles, Tate Hadges took a 6-0, 6-1 decision at second singles and Maura Kiernan didn’t lose a game in a win at third singles. The team of Kristin Bloumbas and Emily Yu recorded a 6-2, 6-0 win at first doubles while Rachel Stryke and Olivia Groebe prevailed 6-1, 6-1 at second doubles. "Franklin senior Steven Luttazi hadn’t had his best performance at the plate, held without a hit through the first seven innings. But his day changed with one swing of the bat. When the Panthers needed him the most, the senior delivered a clutch two-out single to drive in the go-ahead run in the top of the eighth inning. 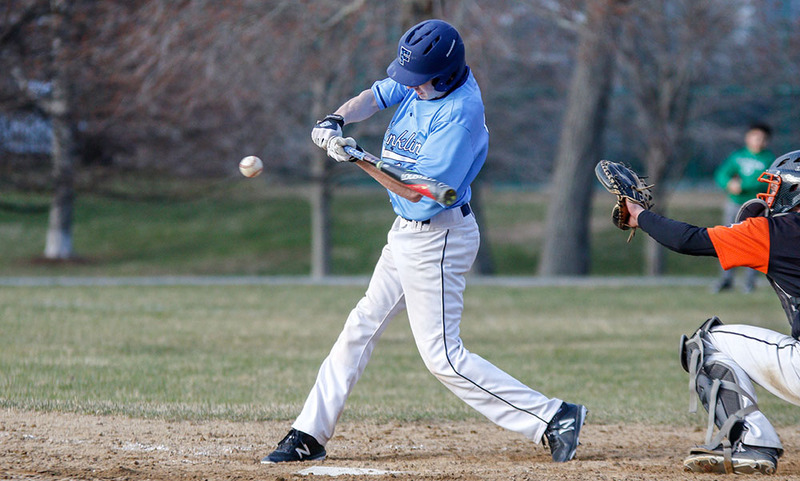 Junior Jake Macchi followed with a monster two-run double and Franklin prevailed from Frothingham Park with a 5-2 decision in eight innings. Franklin was three outs from earning a win in regulation, but Oliver Ames rallied to tie the game in the bottom of the seventh. But instead of wilting, the Panthers responded — all with two outs."